as i won’t announce eventual updates of the tracks individualy. The Autodrom Most is located in the northern part of the Czech Republik near the german border. The region of Most is known for brown coal mining and chemical industries. The first international motorsport event in Most was held 1979, when the FIA-Interserie Coupe organized two races on a 3,45 km circuit. About 50 000 spectators proved this first attempt behind the "iron curtain" a big success. Most has been part of the Interserie-Calendar ever since. For those of you who do not know too much about the Interserie, here are some facts: In the 1960s there had been a successful championship in northern america called "CanAm". The CanAm-Rules were quite simple: open-cockpit double-seater with a minimum weight - I believe it was about 800 kg. No limitations on the engine. This championship soon became enormous popular in the USA and Canada, as many well-known drivers like Bruce McLaren, Denny Hulme, Mario Andretti, Jo Siffert or John Surtees joined the races - attracted by huge price-money. The CanAm-Cars like the McLaren M8F, Porsche 917 or Chapparal with up to 8 Litres-engines proved to be the fastest racing-cars of that time - even faster than F1 or Indy-Cars. 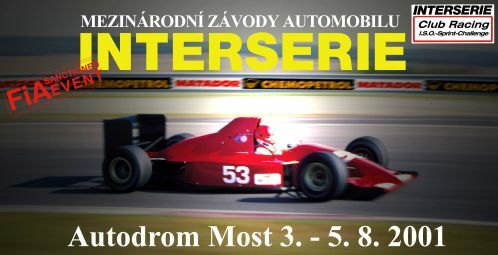 In 1970 the Interserie was founded as an european equivalent to the CanAm-Series. Since then, drivers like Jochen Mass, Hans-Joachim Stuck, Emerson Fittipaldi, Gerhard Berger, Klaus Ludwig, Bernd Schneider or Manuel Reuter raced and won in the Interserie. The technical regulations of the Interserie changed several times within the 30 years, from the huge 1200 hp-Porsche 917/30-style CanAm-Racers, Group C-Car-Racing to the current state. Today, you can enter the Interserie with almost every high-performance racing car - F1, F3000, WSC, IndyCar or Group C.
But let’s get back to Most. 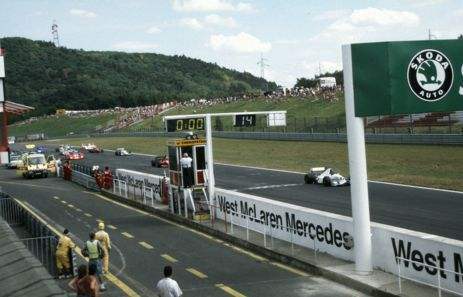 In 1983 the Autodrom Most was built and opend as a permanent circuit. The first race on the 4,125 km track was - of course - a Interserie-race. Throughout the 1980s, the Interserie-Races in Most proved to be one of the most attractive motorsport events in europe: Up to 150 000 spectators used to be there! One of the main reasons for this was the location of the track near the East-German-Border. Many Motorsport-Fans from the former GDR took the chance to see their heros like Mass or Stuck in the Group C-Porsches live in action. Today the Czech Truck Grand Prix is the most important event in Most. The historical TGP-F1-Championship raced there, too. In 1999, McLaren sent the double-seater F1 to Most for some exhibition laps. The track itself is pretty much a drivers track. Many guys like to race there, because Most has a challenging character. I tried to keep the feeling in this gp2-track. I hope it worked out right.